Basic anatomy: The arm consists of three major bones. The humerus runs from the shoulder to the elbow. This is called the upper arm, or, simply, the arm. At the elbow, the humerus connects with two bones: the radius and the ulna. These bones go from the elbow to the wrist and are regarded as the forearm. Alignment: The relationship of how the broken portions of the bone come together. This is an indication of how badly a bone is broken. Angulation: The angle formed by the broken pieces of bone. Another measure of the seriousness of the break. Fracture: A crack in the bone. This is another word for a broken bone. Almost all injuries to the arm that result in a broken bone are caused in two ways: falls and direct trauma. The typical fall that produces a fracture occurs when a person falls on an outstretched hand. The location of the fracture can be from the wrist up to the shoulder depending on the direction of the fall, the age of the person, and other factors that modify the stresses applied to the bone. Direct trauma can be from a direct blow from an object such as a bat, the trauma during a car accident, or any accident that causes the direct application of force to a part of the arm. The initial evaluation by any physician, in the office or in the emergency department, begins with a thorough history and physical exam. By finding out the details of the accident, the doctor is able to determine what damage was done based on the mechanism of the trauma. After taking a history, the physician will do a complete physical exam with special focus on the painful areas. The doctor is looking for signs of a fracture (such as swelling or deformity) and checking for possible nerve or blood vessel damage. X-rays are typically the test used to assess for broken bones. At least two views of the arm are taken. Initially, most broken bones will have an apparent fracture or other abnormality on the X-ray. Some fractures are not always visible on the first set of X-rays. In those instances, a CT scan or MRI may be performed immediately for further evaluation, or follow-up X-rays may be obtained at a later date. The most important aspect of first aid is to stabilize the arm. Do this by using a towel as a sling. Place it under the arm and then around the neck. An alternate approach to keep the arm from moving is to position a rolled and taped newspaper along the swollen area and to tape it in place. Apply ice to the injured area. This can help to decrease pain and swelling. Place ice in a bag and leave it on the arm for 20-30 minutes at a time. It may be helpful to place a towel around the ice bag or in between the bag and the skin to protect the skin from getting too cold. Never put ice directly on the skin. The most important aspect of treating fractures is to determine which fractures can be treated with outpatient care, and which require admission to the hospital. In most instances, the broken arm will be able to be treated in the emergency department. 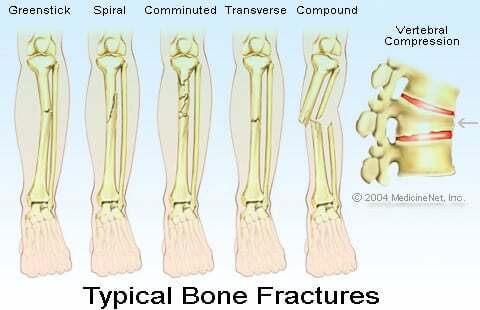 Most fractures will need to have a splint or partial cast applied to stabilize the broken bones. Some breaks especially in the upper arm and shoulder may only need to be immobilized in a sling. In addition to splinting the broken arm, the physician will prescribe medicines for pain control and ice to decrease swelling. Most broken arms will not require admission to the hospital. For all other fractures, the treating doctor will suggest the patient follow up with an orthopedic doctor (bone specialist). At that time, the orthopedist will determine what further care (continued splinting, casting, or surgery) is necessary based on the type of fracture. Wear any support device (splint, sling, or brace, for example) until the patient sees hte doctor for follow-up. Keep the splint or cast clean and dry. Apply ice to the injured area for 20-30 minutes 4-5 times a day. Keep the arm elevated above the heart as much as possible to decrease swelling. Use pillows to prop the arm while in bed or sitting in a chair. Take pain medicine as prescribed. Do not drink or drive if while taking narcotic pain medication. Call the doctor for increased pain, loss of sensation, or if the fingers or hand turn cold or blue. There are two main ways to help prevent a broken arm. Wear appropriate personal safety equipment as protection. Wearing car seat belts, using wrist guards for in-line skating and skateboarding, and wearing appropriate pads for contact sports are all good ways to prevent bone fractures. Prevent and treat osteoporosis-the disease causing bone loss especially in older women. These women tend to have more fractures as they age. In this group, the use of calcium supplements and estrogen replacement would help to reduce the number of fractures resulting from weakened bones. The best treatment for osteoporosis is prevention. This is best done early in life by building stronger bones through a good diet and exercise. Women of all ages should discuss techniques for prevention and treatment of ongoing osteoporosis with their doctor. The majority of fractures heal and normal arm movement is restored. Earlier treatment usually improves results. Fractures in younger children and adolescents tend to heal better. Fractures that have multiple breaks, involve a joint, have open wounds, or become infected could have healing complications. Older adults have increased chance of losing some ability or movement in the broken arm. Chronic diseases such as osteoporosis and diabetes may slow the healing process. Fractured forearm of both bones (radius and ulna). Photos courtesy of Courtney Bethel, MD, and Anthony Dean, MD. Click to view larger image. Forearm fracture with multiple fragments Click to view larger image. Upper arm fracture after casting Click to view larger image. Forearm fracture (ulna) after splint application Click to view larger image. Broken shoulder (humerus). Click to view larger image. 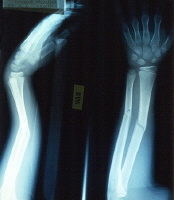 Fracture of the forearm in a child. Click to view larger image. a decreased sensation or inability to move the arm, which may indicate nerve damage. How did you break your arm?